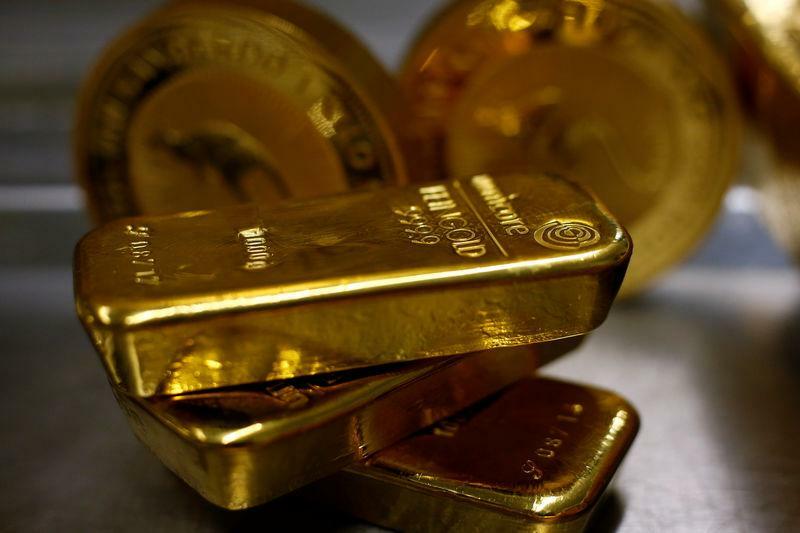 (Reuters) - Gold rose 1 percent to briefly breach $1,300 an ounce on Monday and remained at its highest in more than a week as the dollar slipped and a recent equities rally paused. Spot gold was up 0.5 percent at $1,297.84 per ounce as of 2:12 p.m. EDT (1812 GMT) after rising as much as 1 percent to $1,303.61 per ounce, its highest since March 28. U.S. gold futures settled 0.5 percent higher at $1,301.9 an ounce. "There's a little bit of easing risk appetite, the U.S. dollar is weak and we saw Chinese central bank's acquisition of gold for a fourth month. A combination of all these factors have moved gold into the $1,300s," said Bart Melek, head of commodity strategies at TD Securities in Toronto. "There is significant support around the $1,290 levels. We continue to see reasons for more gold positioning should volatility move higher." The markets are waiting for the minutes of the Federal Open Market Committee's (FOMC) March policy meeting, due on Wednesday, for cues on the Fed's future monetary policy stance. "If the U.S. Federal Reserve had discussed about rate cuts (in March), that should weaken the dollar a little bit and help gold," Melek added. A rally in stocks, which had capped gold's gains recently, paused, while the dollar shed over 0.3 percent against a basket of currencies. A weaker dollar makes gold cheaper for holders of other currencies. Data on Friday showed employment growth in the U.S. accelerated from a 17-month low in March, assuaging fears of an abrupt slowdown in economic activity, but a moderation in wage gains supported the Fed's decision to suspend further interest rate rises this year. However, holdings in the world's largest gold-backed exchange-traded fund, SPDR Gold Trust, fell as much as 3 percent in the previous week, its biggest weekly percentage decline since end-November 2016. "Trader and investor attitudes are still generally upbeat, which is bullish for the world stock markets and still a bearish element for the safe-haven metals," Jim Wyckoff, senior analyst with Kitco Metals said in a note. Spot platinum was up 1.6 percent at $909.25 per ounce, after touching its highest since May 2018 at $914.74 earlier in the session. "Some potential mining unrest in South Africa on wage negotiations is dragging on and has provided the fundamental backdrop," said Saxo Bank analyst Ole Hansen. Palladium rose 0.8 percent to $1,380.51, while silver gained 1.1 percent to $15.25 per ounce.